Although you hear many people using the term 'stupid cow' or some such, from my observations they are far from stupid. Each member of my herd has particular character traits and behavior that are uniquely their own. 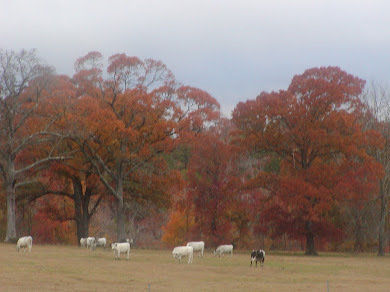 Cow family groups are often found grazing together -- the Grandmother, Daughters, and Granddaughters. 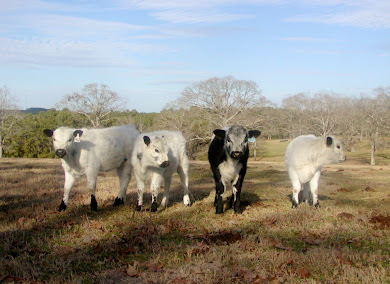 Most often many traits of the sire and dam in terms of personality and behavior are passed on to their calves. 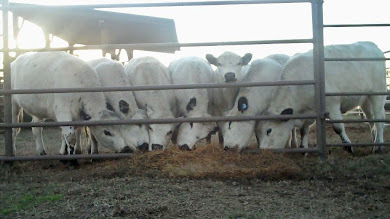 Most cattle breeders are familiar with the term "heritability", and certain behavioral as well as physical traits are quite heritable in cattle. 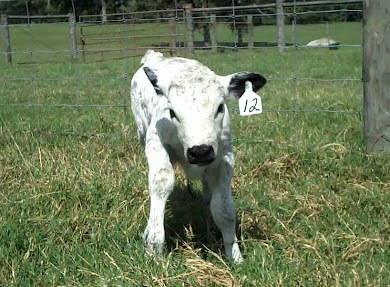 If a cow or bull is inclined to be more curious and precocious, the probability is great that their calves will have some degree of this same trait. If a cow is a pushy sort of girl, then look for that to express itself in her offspring, and so on with the whole gamut of possibilities. Old 18 was, and is now again, a gentle and quiet old girl, easily contented. While we generally see these desirable behavioral traits of cows passed on to their calves, every now and then the odd one hits the ground -- the odd calf born to very good-natured parents that is inexplicably disconnected from kinship with it's family group, and typically much more aggressive about protecting its personal 'flight zone' space. 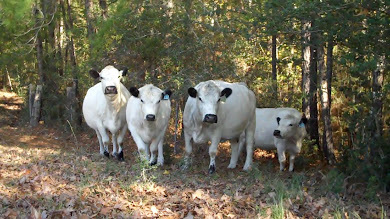 You can rarely see it in their eyes unless you are their target -- they just don't have a lot to give of themselves and they like it that way -- and, yes, I'm referring to the few odd cows and calves I've encountered and the human misfits, who are quite often Sociopathic Serial Bullies, which is one of the most damaging degrees of sickness for the narcissistic human misfit. The odd bovine misfits won't be found licking the face of their sisters or their mother, hanging out under a tree with their family group, helping with the care-taking of one another just doesn't happen -- unless of course there is personal gain, but a cow doesn't generally hang with another for personal gain. While they most definitely aren't stupid, they wouldn't conceive of the using or abusing of another's emotions as the path to filling their belly with the best the rancher has to offer -- but without a doubt a human misfit will. 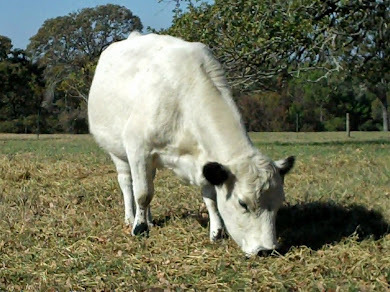 This summer Old 18, a very aged cow, returned to my herd -- I've referred to her as 'Old 18' in an earlier essay, and she is pictured above in November of 2004. I placed Old 18 a couple of years ago with a nice family nearby who could keep her in smaller pastures that wouldn't be so hard on her bad hip. However, this respite from life in a big herd was short-lived, and she was traded into a commercial herd where she was just one of a group of many -- her physical limitations no doubt of little consequence to the new owner. 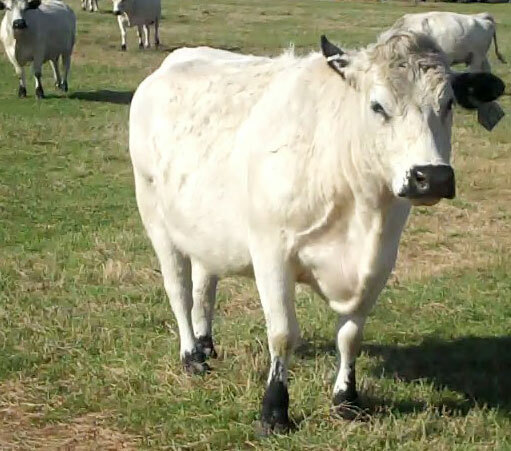 She was brought back to me because she is too aged to be of value to the typical rancher, and I did not want her taken to an auction barn where she would undoubtedly suffer from ill behavior on the part of humans -- and she did not deserve that treatment after all her years of service to us humans. Initially, I was irritated at the cavalier treatment of Old 18 by the fellow that dropped her off in the cattle pens. But upon second thought, at least he had the courage and the care to try to do what was now best for her now that her usefulness to him was over. He could have put her in a pasture corner and simply ignored her until she died a so-called natural death. ***"Question: I feel so ill and desperate I sometimes have suicidal thoughts? Answer: These feelings, which include reactive depression, are a normal reaction to an abnormal situation. You are not mentally ill, but mentally injured and fatigued. The cause is external which means someone is responsible and liable for your condition. Question: Why am I a victim? Answer: You're not a victim, you're a target. The bully has deliberately and intentionally targeted you. It is the bully's pattern of behaviour with constant nitpicking criticisms, false allegations and so on which reveals intent." The days can be long for a rancher, it's not at all a glam pursuit. Most often the days are filled with the more gainful side of one's occupations that support the rearing of cattle -- and at the close of the day as dusk approaches you take that walk and check on those who may be in need of your attention. Sadly, human misfits have so little 'humanity' that they can't be bothered to even take this same little bit of time, this brief walk, with aged or injured human family members -- their own time, their own health, is all that matters. The human misfit's self-importance is so great that they can't be bothered to check upon and observe the health of nearby family members that have in their view failed to supply or comply with their wishes -- a cow would never be so cold. Old 18 has another cow that has bonded with her and they are now often found together keeping one another company. If I had daughters here at the ranch from Old 18, I've no doubt they would be seen regularly at her side. Sadly, when it's a human misfit, much harm can be done to the entire family unit when one exceedingly malicious person is born into that fold. When it's a cow that is a bad apple, eventually it's seen and accepted as such by us humans, and we let someone else see what they can do with the cow by way of the auction barn -- just maybe it would prefer different, or better, digs to call home. With humans, we can't just dispose of the family member and let someone else try to work through their personal issues -- we can only hope the misfit human will win the lotto and just go away and stop causing such unnecessary pain and distress to the other members of the family unit -- or best of all, hope they'll surely come to their senses and be that loving and care-giving human that is a reflection of the family unit. This generally doesn't prove to happen. Instead, that human continues to cause extreme pain and distress to the vulnerable family members who can't fathom the root of their malice, and can't fathom the depth of their deceits. 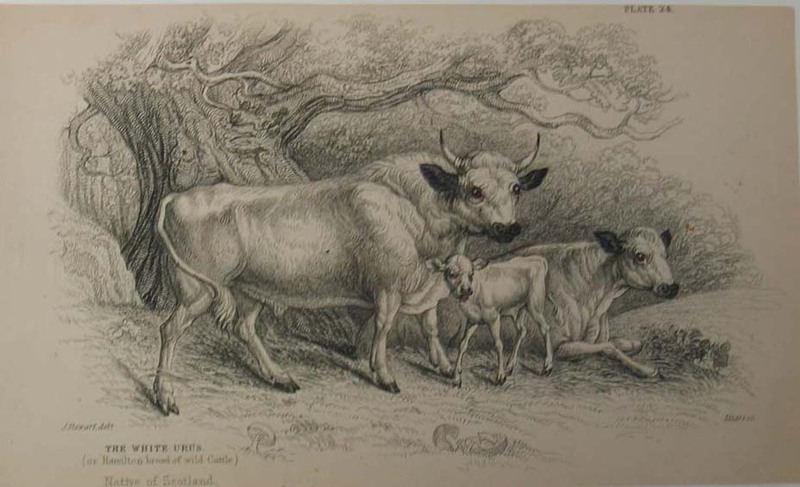 But it is not theirs to fathom, it is an anomaly of nature -- much better they all would be not to try to fathom the depths of the odd misfit human, but to put them aside and go on, much like one assumes a cow family must surely do by simple animal instinct. But in the daily course of life that realization of one bad apple being a weird anomaly of nature is hard to accept by a human mother, father, or siblings -- painful to work with, and the attempt at acceptance of the misfit human puts other loved ones in harms away, drains away their spirit, and takes away their beautiful smile. . . perhaps forever. With the misfit cow, we let it go elsewhere so it's behavior won't be a daily pain in the rear, won't perhaps influence the behavior of other cows and calves by example. With the misfit human who just doesn't go away, and most likely we don't want to go away, we remain so hopeful of a return of kindness and care to their character that we allow them to remain in our family unit. Because of their mutual love of their mother, father, or siblings; the family unit remains in a state of hope that the human misfit will find again the clarity and gentleness of spirit of their youth, that can perhaps be likened to the young calf feeling the strength and the wonder of it's legs as it dashes across the pasture without an agenda at hand. Sounds sappy, and it is, and it's just what your human misfit wants you to do, believe . . .hope. . . there is an end to the emotional pain in sight, if you'll just provide what they seek this time -- manipulation is perhaps their greatest skill. Old 18 seems to be handling the cold of winter fairly well. I was concerned about her being in perhaps a great deal of joint pain with the change of the season, but so far she seems to be at a constant level of ease. It's not unusual to find Old 18 resting with all the baby calves gathered around her, their dams designating the old girl as the babysitter for the day. Oftentimes, the youngsters make a mad dash to her and run around her, as though they're trying to encourage her to have some play time with them. As long as I see that she is content, she'll remain with me, and with this earth . . . I think she's well worth the extra time and care-taking. NOTE: I imagine this blog will only bother those people who feel uncomfortable with themselves upon reading it. Individuals with narcissistic personality disorder often cross a moral line into Sociopathic Serial Bully disorder. Sociopathic Serial Bully? Serial bullies harbour a particular hatred of anyone who can articulate their behaviour profile, either verbally or in writing . . . in a manner which helps other people see through their deception and their mask of deceit. Serial bullies hate to see themselves and their behaviour reflected as if they are looking into a mirror. "Yet, the prime rule of narcissism must never be forgotten: the narcissist uses anything available to obtain his (or her) Narcissistic Supply. Children happen to be more attached to the female narcissist because women are still the primary caregivers and the ones who give birth. It is easier for a woman to think of her children (or her own mother) as her extensions because they once indeed were her physical extensions and because her on-going interaction with them is both more intensive and more extensive. . . .Devoid of the diversity of alternatives available to men – the narcissistic woman fights to maintain her most reliable source of supply: her children (or parents). Through insidious indoctrination, guilt formation, emotional extortion, deprivation and other psychological mechanisms, she tries to induce in them a dependence, which cannot be easily unraveled. But, there is no psychodynamic difference between children as sources of narcissistic supply - and money, or intellect, or any other Source of Narcissistic Supply. So, there is no psychodynamic difference between male and female narcissists. The only difference is in their choices of sources of narcissistic supply." Follow this link for an online Narcissistic Abuse Message Board.